Are you in charge of marketing at your company, yet struggling to get buy-in or communicate across departments to get things done? The truth is that modern marketing teams have to partner with other business units. In the past, we were able to go off and do our “marketing things” like PR and trade shows that required very little overlap with other departments. You’re probably worrying daily about how to get your message out to the world, so you need a place to put it on your site. You probably care a lot about getting people to accomplish their goals so you can accomplish theirs, so you need to work closely with product. You probably care a lot about your brand and how your potential customers experience it, so you need a design partner. And at the end of the day, you and your team are directly on the hook for bringing in the traffic and potential customers for your product team, sales team, or whoever is responsible for the close (maybe that’s you). And you can’t do it alone. 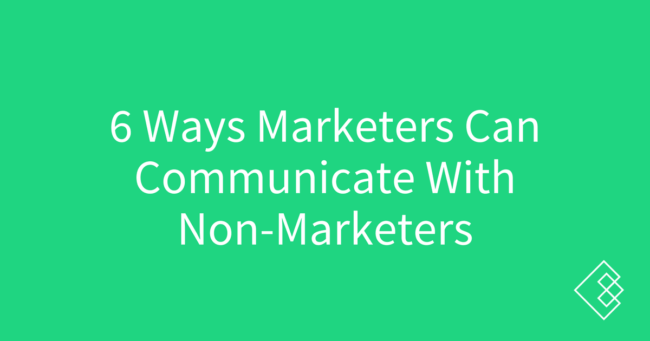 Here are 6 ways I’ve found to keep communication open with non-marketing teams internally. This way, you are all speaking at least weekly to everyone else who is in charge of business units. schedule quick times to chat with other stakeholders that week about ongoing projects or issues. I have found that without a direct reason, these meetings can quickly devolve into time-wasting expenditures. Since you are all marketing leaders, this becomes a very expensive meeting to have if there is no purpose to it. Don’t think about this meeting as a time to build rapport with others at your same level. You should be doing that at after-work happy hours, lunches, or other times. This meeting is all about business. Every month, you should be reviewing the previous month’s metrics so that you are prepared for the coming months and quarters. This exercise in pulling metrics each month can help you spot trends and potential areas of improvement. In this meeting, I recommend that you open it and present the top level metrics (year on year, areas of commendation for the month) but then have each channel owner report on the specific data and happenings in their area. Every quarter, you should do at least a morning or afternoon, and ideally a full day, with your peers to plan out the quarter ahead based off of your plans that have been put together with your individual teams and the projects they are working on. You should all walk out of there with everyone else understanding what your team is going to be working on, what the goals are, and what help you will need from other teams to be successful. If you are the marketing leader, that means you have other marketers working for you who are hopefully owning specific marketing or growth channels. Your job is to set a good example for all of them with the meetings you are having with stakeholders, and you need to hold each team member accountable to working well with others internally if they are going to be effective. You should require each member of your team to have consistent catch ups with those they are partnered with to push projects forward. Every week you should also your team member how the projects are moving along, and especially about any challenges they are having getting what they need. I’ll be honest – a lot of companies talk about this but very few actually do it. The ones who do it find them to be incredibly valuable. If you have some budget to spend, buy lunch once a month and invite the teams who are working directly with the marketing team to attend. Have someone from your team put together a 20 minute presentation on what they do and how they do it. What I have found most often is that people don’t value marketing because they do not understand it. They might know that you’re doing SEO or doing PPC or Facebook Ads (likely because they are retargeted by them…), but they don’t understand what that means, why you are doing it, or why it matters. Help them understand. And feed them. A good CEO will value all of the teams within the organization, and a representative from each should be able to give an update about the cool things they’ve worked on and why they matter for the company. As the marketing leader, your goal should be to also explain how others can help. Whether that is sharing open positions, linking to your website from their personal websites, coming up with blog post ideas, whatever. People love to help. What have you found that has helped you, as the marketing leader, communicate with non-marketing teams and get buy-in across the company?